You could even read a book on the beach! Are you 5-12 years old? From 1st December – 31st January, pick up a Summer Reading Booklet from your local library (or print a copy, or use our interactive list online!) and see how many you can read. Write a Kids’ Club review for every book you read from the list and they will be published on the Kids Blog. Your reviews will earn you prizes, which can be collected from your local library. You’ll earn your first prize after writing 2 reviews, and then after every 5th review from then on. A librarian will contact you when your prize is ready to be collected. But the winning doesn’t stop there… Every review you write will gain you an entry into the Challenge’s main prize draw, which will be drawn in early February. The prize will include lots of goodies like books, CDs, vouchers, chocolate, library bags, toys and games, posters, stickers, and much more! Sounds easy right? It is! There are also lots of series — and any title from those series counts — you can read more than one! Read a book from the list. There’s lots of variety in the list to suit everyone’s reading tastes. You can even borrow an eBook or eAudiobook. Write a review- head over to the Kids Club Page to find the review form. Check out some tips on writing book reviews on our Reviews page. Your review will be published on the Kids Blog within a day or two. You will earn prizes for your reviews – you’ll get your first prize after your first 2 reviews, and then after every 5th review from then on. A librarian will contact you when you’ve earned a prize, which can be collected from your local library. The more books your read and review, the better your chances of winning the main prize pack! And don’t forget, you can visit our interactive online Interactive Summer Reading booklist! 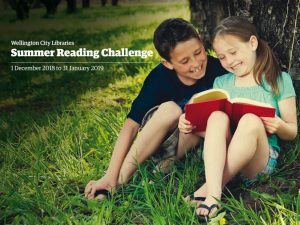 The Summer Reading Challenge booklet is available from all Wellington City Libraries from Friday 1st December. 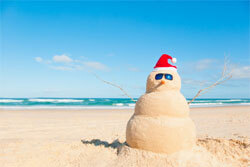 The challenge will finish at midnight on Wednesday 31st January. Open to all 5-12 year olds who have their own Wellington City Libraries membership (information about joining the library). This is a free challenge, no registration required. The Summer Reading Challenge is run as part of the on-going Kids’ Club. All Kids’ Club details and rules apply (see below). Any reviews submitted before 1st December or after 31st January 2019 will not count towards the Summer Reading Challenge, but will be recognised as Kids’ Club reviews as per the usual procedure. The book list contains many book series. Any title in the series counts for the Summer Reading Challenge. For example, any title in the Redwall series will count towards your entry in the draw, and you should write a review for each book in the series that you read. Only books from the booklist read between 1st Dec – 31st Jan are able to be reviewed and counted towards the challenge. So if you have already read some of the books before, you should challenge yourself to read the ones on the list that you haven’t. The prize winners will be drawn and notified over the first two weeks of February 2019. We will take reasonable steps to contact the winners. A new draw will take place if the winners can’t be contacted. All decisions are final. What happens if you’ve read a book before on the list and you’ve already reviewed it??? That’s cool that you’ve already read some! You should choose something you haven’t read from the list and read and review that instead. Happy reading! We love our library in Miramar because they help find us amazing books and we sometimes get free pizza from hells. My kid has submitted many reviews, but they’re not showing up online nor has she received any information about rewards. Is there a way to know the submission form is working? Hi Lucas, I have sent you an email so we can sort out what’s been happening to your child’s reviews — hopefully they haven’t been flying off into cyberspace!